A ball of fun and technical perfection...but an edge or two wouldn't hurt. 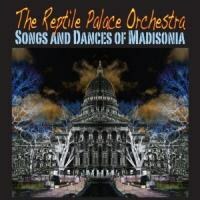 Here in Madison, Wisconsin, everyone knows about the Reptile Palace Orchestra. Well, maybe not everyone -- you have to be paying attention to local music, and/or international music, and/or dance music, and/or any of our dozens of street fairs, and arts celebrations. Everywhere people get together, the RPO is there, making people dance with their hybrid of Eastern European folk music and...well, every other music they've ever heard. Their latest salvo, Songs and Dances of Madisonia, takes on music both exotic and vaguely familiar-sounding. They lead off with "Sev Kardesim", a piece often called the "Turkish Hora". Sure, it sounds a lot like you've just stumbled into an excellent bat mitzvah, but Maggie Weiser's impassioned vocals push all the right buttons. Later, the group takes on the Roaring Lion calypso tune "Wash Your Hands", overlaying it with tons of strange electronic filigree and mournful violin noises. Just like something you might have heard before but just a little different, and slightly twisted (kind of like Madison itself, actually). The group takes on Algerian, Bulgarian, and Macedonian traditional tunes, paying proper respect but making them their own. They welcome guest vocalist Myriam Darsouni for a romp through "Marakebna Al Mina", with Bill Feeny's stinging guitar lines turning it into something resembling new wave. "Byala Roza" mutates from a classic folk tune into post-rock tango, kind of, maybe -- but with trumpeter Anna Purnell's lovely voice leaning into the lyrics, labels don't really matter, do they? There are also some great originals here. Cellist and conceptualist Seth Blair gets to take a tour on vocalist on the spooky "Skeleton Dance", which is actually closer to neo-lounge klezmer than it is to anything else. Blair's composition "Lactic Acid" is straight-up funk music, if we can define "straight-up" as "completely off the rails and lacking any pretense of decorum, plus steel drum solos." Multi-instrumentalist Biff Blumfumgagnge -- one of the tests of true Madisonia is whether or not you can spell that name from memory -- gets to pen a couple hot workouts, including "Rude Oud", an attempt to completely reclaim that instrument for off-kilter multi-time-signature dance music, but it's Greg Smith's free-range tenor sax solo that sets this one off. Not enough can be said for the flexibility of this ensemble. Ed Feeny and Robert Schoville are a nimble and inventive rhythm section. Kia Karlen's accordion holds things together when they threaten to veer too wildly to one side or another. And the Blair/Blumfumgagnge core at the center makes sure everything is charmingly anarchic. After all, without a little anarchy, what good is anything? So if you need a soundtrack for your cookout (microbrews, veggie brats from the Willy Street Co-op, sketchy potato salad brought by your ex-cousin-in-law who's still a pretty nice guy after all), or for your next attempt to recall your lying governor, you had better have this disc on heavy repeat. Over and out from Madisonia.